Three years later, the tower stands on the riverfront, downtown skyline, noticeably incomplete. It is as though the face of the city, the skyline, were missing several teeth in its grin. The building gapes. It’s been three years. The city government can do nothing. The developers are not finishing the condo tower, and no one is demolishing it. It is a private matter, this hole in the public face of the city. Beams straining, slabs cracking, early December three years ago, the six-story parking garage at the construction site came crashing down before the sun came up. Two days after the collapse, body of Willie Edwards III, construction worker, single dad, working overtime to pay for upcoming Christmas, was pulled from beneath concrete and steel cables. It’s been three years. 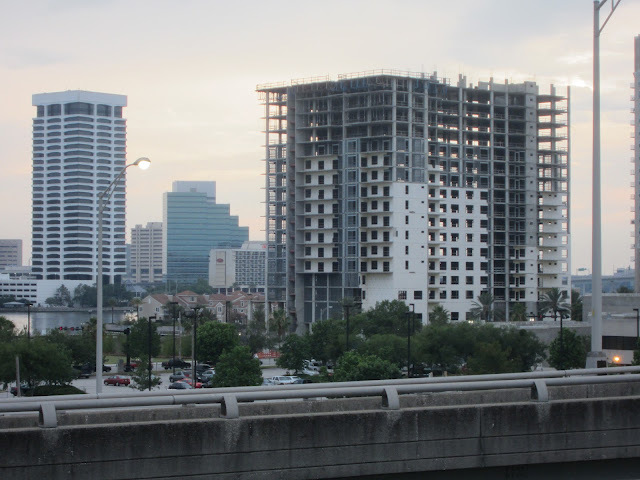 Those who live in the first condominium tower at Berkman Plaza look out their windows and off their balconies to see the 23-story skeleton of Berkman II standing on the riverfront, ghost tower, sad wreck. Three years ago, promotional material said, “Good things come to those who wait.” Presently, the cliché sounds like mockery. Construction workers reinforced concrete ramps in the parking garage with rebar and metal support before realizing floor plans hadn’t specified such reinforcement for lower ramps they had already built. The ramp from the second to the third floor was unreinforced and unreliable. Support beams in the garage spanned 58 feet before connecting to the columns intended to uphold them, and 20-inch concrete slabs sat on top of these beams. Strands of cable within the concrete had become tangled and left large air pockets within the concrete. The construction company later said the design was fatally flawed, but that they hadn’t known that at the time of construction. An engineering professor later testified that if completed, it would not have been possible for the building to stay standing up. It’s been three years. The city’s skyline is inhabited by a 23-story haunted house, wreckage and ruin of a place that never quite existed, like the Confederacy itself, a stillborn structure. The accountant sitting on her balcony at tower number one wonders about the construction of her own building. She sips a rum and coke and looks into the empty shell across the open air. Berkman II will never be finished, she thinks, and Berkman II will never be demolished.